Recombinant fragment, corresponding to a region within amino acids 20-223 of Human RbBP5 (UniProt: Q15291). A431 whole cell lysate; A431 cells. Our Abpromise guarantee covers the use of ab154755 in the following tested applications. WB 1/500 - 1/3000. Predicted molecular weight: 59 kDa. 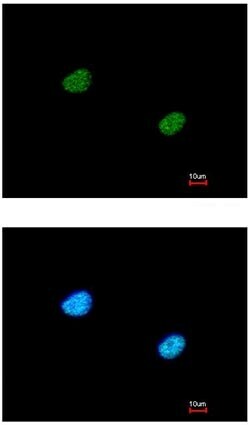 As part of the MLL1/MLL complex it is involved in methylation and dimethylation at 'Lys-4' of histone H3. H3 'Lys-4' methylation represents a specific tag for epigenetic transcriptional activation. 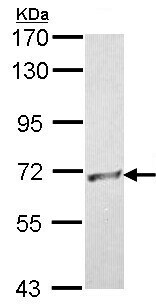 Immunofluorescent analysis of paraformaldehyde-fixed A431 cells labeling RbBP5 with ab154755 at 1/200 dilution. Lower panel co-stained with Hoechst 33342.
ab154755 has not yet been referenced specifically in any publications. Publishing research using ab154755? Please let us know so that we can cite the reference in this datasheet. There are currently no Customer reviews or Questions for ab154755.